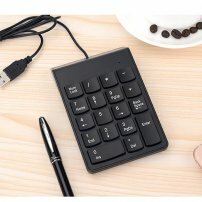 Slim Portable USB Numeric Keypad / Mini Number Pad for Windows 10, Windows 7 [USB005752B] : Onchee.com - the accessory shop for all your handheld Electronics! This numeric keypad is designed for Win XP / Win 7 / Win 8 / Win 10 / Mac iOS. To give customers a better user experience, the numeric keyboard has an ergonomic design too. - ERGONOMIC DESIGN: With a special designed angle, this mini numeric keypad is convenient to carry and keep. Besides, the ergonomic tilt and anti-slip pads on back provides optimum comfort. - Full-size 19mm key's interval improves speed and accuracy by making it easier to locate and press the numbers you are looking for. - Numeric keypad supports NumLock. - QUIET SOFT TOUCH: Integrated ergonomic tilt provides added comfort which helps reduce strain, great for those working on spreadsheets, accounting files or financial applications. COMPATIBILITY: Works with PC and desktop computers that have Windows 2000, XP, Vista, Window 7, or Windows 10 operating systems. - Product Dimensions: 140*85*20mm approx. - Key Interval: 19mm approx.